Paint Your Own Pottery Saturdays, 10:00 am – 2:00 pm. December 15, January 12th, February 9th, March 16th, April 13th and/or May 4th. 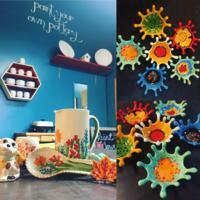 The Gunnison Arts Center’s Paint Your Own Pottery has an extensive selection of bisque-ware items to choose from including plates, bowls, mugs, serving trays, to-go mugs with lids, kids items, animals, home-décor pieces and more. You choose the piece and our staff will be here to help you with ideas and make sure you go home with a great keepsake or gift. This is a great creative activity for kids and families. There is no need to pre-register or reserve a spot, just come on in and the staff will get you all set up to glaze. Prices vary depending on the piece you choose; $5 – $45. No sitting fee; all supplies and instruction are included in the price of the item. Please allow one-two weeks for work to be kiln fired and ready for pick-up. We can ship finished pieces for an additional shipping charge.